Beautiful real natural silk digital printing on the finest quality Silks and Satins. Use your own designs and images to custom print silk for your project. 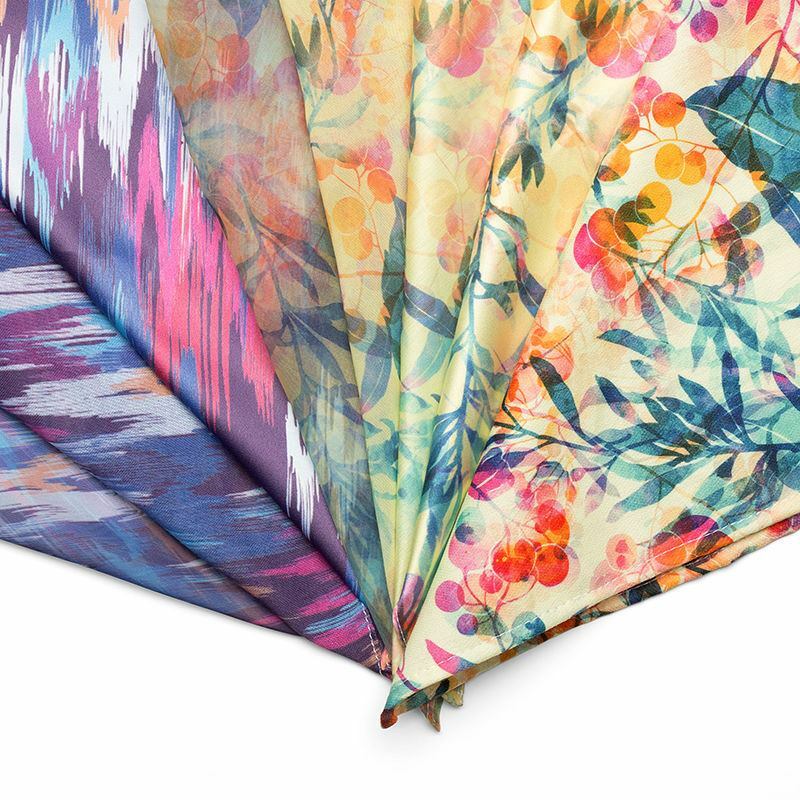 Digital silk prints are perfect for fashion designers and makers. No minimum order, plus hemming option available. Five types of silk including real and poly silk. Silk is one of the most wonderful fabrics ever made with it's incredible drape, texture and feel. If you need to print on silk fabric you will be pleased to know we have highest grade real silks, professional colour control and efficient service. We digitally print silk in just a few days and get your printed silk out to you fast. We have no minimum order so you can test small panels to see our professional silk print quality. Choose from natural silk and silk style fabrics for your craft or dressmaking project. Woven real silk alternative. Shiny, shimmery poly face, semi-transparent. Soft and cool against the skin. Clothing, linings, garments. Light weight, soft and non-stretch with a matte finish. Made from 100% natural silk. Silk alternative. Solid, plain closed weave. Shiny face, matt reverse. Slight amount of stretch. Nice drape. Bedding, furnishings. Lightweight. Soft touch. Fine twill weave. dressmaking, accessories and scarves. Durable, smooth, shiny, flowing drape. 85gsm. Natural sheen to face, matt reverse. Scarves, garments, interiors, accessories. Good customer care, able to turn around the order in good time and the quality of printing was spot on. The fabric is perfect for the job, but what I found exceptional was the help online before I submitted the order. It also arrived really soon. Thanks. To start this digital silk printing process click Start above, upload your art design or photo and enter the dimensions, and select silk type. It's that simple. 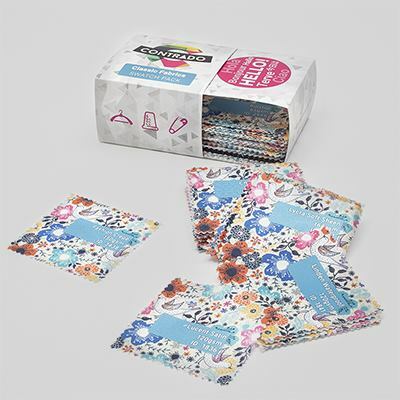 We have tools for tile or repeat available, and rulers and controls for you to make sure you get exactly the right custom silk print you need whether it's a single small panel for your print on silk scarves or your design printed on a few metres of silk. Please note: these gorgeous silk fabrics are 100% natural, so no chemicals have been used on the fibres and you will get rich intense colours due to our specialist printing method. If in doubt, we always suggest ordering a fabric sample or swatch pack before ordering, to see how colours come out on real silk and what the material feels like. With Silk Georgette fabric you should expect a fabric shrinkage of approximately 6% on the weft, and 10% on the warp. Due to the print process, large areas of solid colour may show minor blemishes or discolouration. This is to be expected and we would advise avoiding large solid blocks of colour if possible. We have garment production in our facility, so we added the silk hemming option to our print on silk services, especially for people who want to print on silk scarves. For most textile designers or students, digitally printed scarves are quite a common way to start out with getting designs noticed, and they use us for silk digital fabric printing services. We understand the difficulty of hemming the edges of light, slippery fabrics like silks, and how important it is to get the perfect finish. Therefore we added a silk hemming option since we have these skills in-house. Now you can print your own silk scarves and get them hemmed with us for a little extra. We have a total cut and sew operation here at Contrado the home of Bags of Love. We can add a hem to the exact dimensions you order your silk prints at. We create a small one fold hem that typically uses 5mm of material If you order 100x100cm expect your finished silk fabric to be approx. 99x99cm (after hem and shrinkage). We have black or white thread set up and you choose the best match. On our silk and other light woven fabrics, one hemmed edge will be straight (vertically down the roll) and the other will be slightly rippled due to the silk grain. Perfect for making your own size print on silk scarf and wraps, silk ties, luxury garments, lingerie, dresses, and accessories. Fashion designers use it for a wide range of creative and unique ideas. We are experts at making your designs come to life on the highest grade silk with the greatest vibrancy of colour. Couture designers, silk tie makers, bridal and lingerie makers use our custom printed silk. Occasionally film and theatre productions use our services for scene or dressmaking, especially period work. Interior designers also use our digitally printed silk product for specific requirements in fine detailing and luxury finishes. Other crafters and makers use us to print photos on silk for top end quilting as a photo silk print is outstanding when patched into a quilt. Our digital prints on silk provide a wide range of applications and our fast service and support will benefit your project. Please note that the grain of the fabric can result in a slightly wavy edge, apparent on 2 sides of the hemmed fabric. This is due to the natural softness of the silk, possible shrinking and the weft. It may also be the case that the weave may be irregular and this is a characteristic of the silk fibre and production process. It is worth noting that digital silk designs that have solid straight lines close to edges may suffer distortion, so we advise keeping the design 'lines' if any, a few centimetres from the edges or better still design these risks out. TIP: The Silk Georgette fabric is an amazing and very delicate stretchy fabric, slightly wavy hems are to be expected. Due to the delicate nature and soft handle of the real silks, the edges can be wavy after hemming, especially on the Georgette. We print silk on one side, and whilst there is complete show through on the Georgette silk, the satin has limited show through (20%) and in essence one side looks unprinted. You can be assured of intense, rich colours. 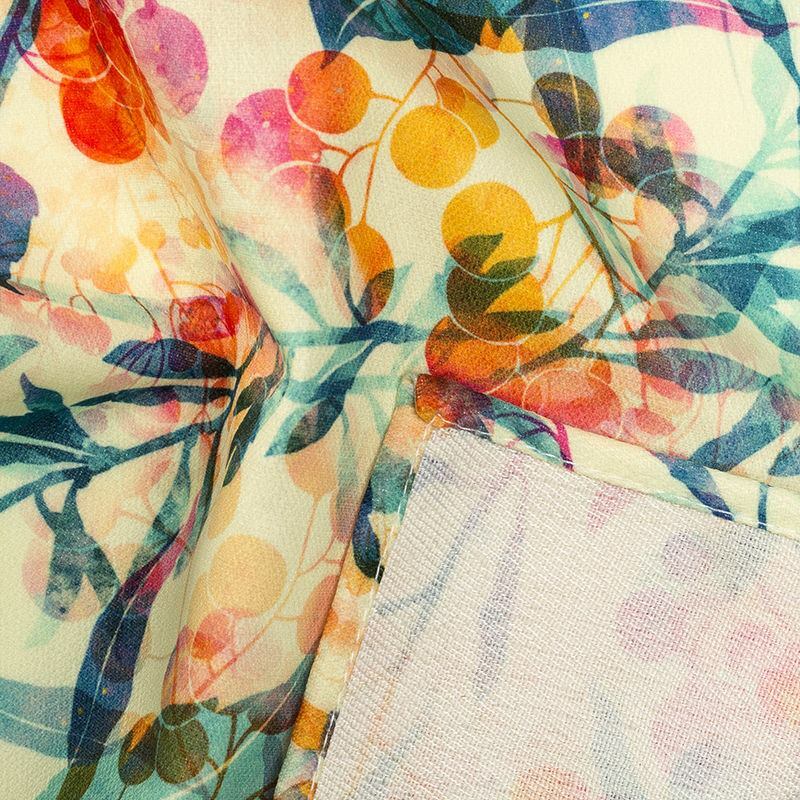 Care of your printed silk: Treat this beautiful material well and it will stay silky and bright for year after year. We recommend dry cleaning only. Wet washing will damage the natural silk textile and print. Treat carefully, as it is a delicate material that can pull if caught. For more information regarding a wholesale discount on silk printing, please feel free to get in contact with our lovely customer service team. Silk printing in London used to be buoyant nearly 150 years when the likes of The Liberty Store introduced specialist silks hand printed with wooden blocks in London and other parts of the UK. These techniques and products faded away over decades until the new methods we introduce allow you to design your own online and have a one-off silk print created. With our extensive knowledge of fabric printing, we offer full-colour print onto 100% silk using the latest specialist printing method which will save the ink deep in the fibre of the fabric, creating a long-lasting vibrant print. Printed and produced in-house in west London, we offer you an extremely high-quality real silk (not synthetic) with your design, or photos printed on silk for small pieces or long runs. We are a one-stop for single silk prints and one of the only silk printing companies around. We buy the plain and perfect silk from a specialist expert provider with over 100 years of supplying the finest silk fabrics to the fashion, interiors and bridal industries, then we expertly apply your design ensuring the highest print and production standards are being met. If you are thinking about silk printing in London UK vs. screen printing the short run solution will win hands down.